Today I am going share with you an overview of Swadhin Bangla Betar Kendra. 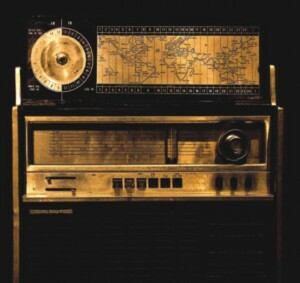 The term “radio” is derived from the Latin word “radius”, meaning “spoke of a wheel, beam of light, ray”. It was first applied to communications in 1881 when, at the suggestion of French scientist Ernest Mercadier, Alexander Graham Bell adopted “radiophone” (meaning “radiated sound”) as an alternate name for his photophone optical transmission system. However, this invention would not be widely adopted. Advances in technology have given people more ways to access an increasing amount of information. Local and international news can be read in the newspaper, listened to on radio, watched on television and found on cell-phones or online. The end of British rule in India in August 1947, accompanied by the Partition of India, gave birth to a new country named Pakistan which constituted Muslim-majority areas in the far east and far west of the Indian subcontinent. The Western zone was popularly (and for a period of time, also officially) termed West Pakistan and the Eastern zone (modern-day Bangladesh) was initially termed East Bengal and later, East Pakistan. The two zones were separated by over thousand miles of Indian territory in the middle, and had vastly different culture. It was widely perceived that the west zone dominated the country, leading to the effective marginalization of the east zone. Growing disenchantment among the people of East Pakistan finally led to civil disobedience followed by Bangladesh Liberation War in 1971. On 26 March 1971, just the day after the Operation Searchlight crackdown, when the brutal mass carnage by the Pakistani invaders plunged the nation into gloom and despair, at that critical juncture of history a voice was heard over Radio saying “SWADHIN BANGLA BIPLOBI BETAR KENDRA THEKE AMI MAJOR ZIA BALCHHI”. With that broadcast the entire nation got back its confidence, courage of conviction and strong optimism. It was all possible because of the galant initiative taken by three young individuals Dr. Syed Anwar Ali, Engineer Ashikul Islam and Engineer Dilip Chandra Das to start with 10 KW transmitter. Since then, during the whole period of Liberation War, Swadhin Bangla Betar Kendra successfully carried out its intellectual war like an organized front and aired patriotic songs which greatly inspired the freedom fighters in their relentless fight against the Pakistan-led occupation forces, war news and talk shows to boost up people’s spirits. In the afternoon of 26 March 1971 a telegram containing the message of Sheikh Mujibur Rahman reached to one Dr. Syed Anwar Ali through some students in Chittagong. The message was translated to Bengali by Dr. Syed Anwar Ali’s wife Dr. Manjula Anwar.